It struck me dimly at the time but I was running late and determined to run Skip Coryell's exclusive Second Amendment March announcement without edit -- mid-April is cherry-blossom time in D.C., not apple blossom. Well, at least they both make good pie. now off press and available for immediate delivery! 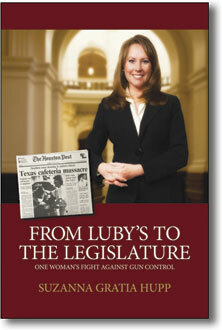 Suzanna Gratia Hupp, who survived the Luby's massacre in Kileen, Texas, and went on to become one of the most pro-rights legislators, has released her eye-witness account and personal story in hardcover; we have copies in stock now! Meet Suzanna and me at the Texas State Rifle Assn. annual meeting this weekend outside Dallas, and at the Texas Concealed Handgun Assn. annual meet outside San Antonio. NEW plain-English gun-owner guides for Massachusetts, Michigan, New Hampshire, North Carolina, South Carolina, Ohio, Virginia and -- NEW JERSEY at last!, plus North and South Dakota in one book. Guides for 27 states, more coming. "If you knew all your rights you might demand them." 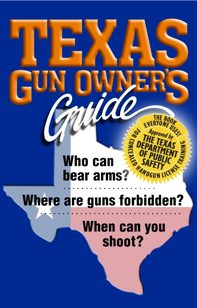 50-State Gun-Law Traveler's Guide for 2010: https://www.gunlaws.com/travel.htm. The Dept. of Homeland Security, run by Janet Napolitano, has lost nearly 300 firearms from 2006 to 2008, with some ending up in the hands of gangbangers, kids, felons, and other miscreants, according to USA Today. This is not terribly surprising since all federal agencies lose guns on a regular basis. What is surprising was the revelation that the department has 190,000 guns, but only 185,000 workers. If you go through an airport or anywhere where these taxpayer-supported jihadi-resistance workers work, you know very few bear arms. That's a lot of guns for the limited percentage of DHS people that carry. The media talks about civilians stockpiling ammo, you have to wonder how much ammo DHS has stockpiled for the 190,000 guns we bought for them. "Stinging sleet, snow and poor visibility took away any chance of winning the 10km biathlon sprint for American Tim Burke, a favorite to win a biathlon medal. The first biathletes to go off on Sunday skied and fired their rifles in a light rain, while those who went off later -- including Burke -- admittedly had no chance due to a sudden turn for the worse in the weather. 'The people starting in the middle of the pack had no chance today. Unfortunately, I was one of those,' Burke said." Nothing again. This is getting old. 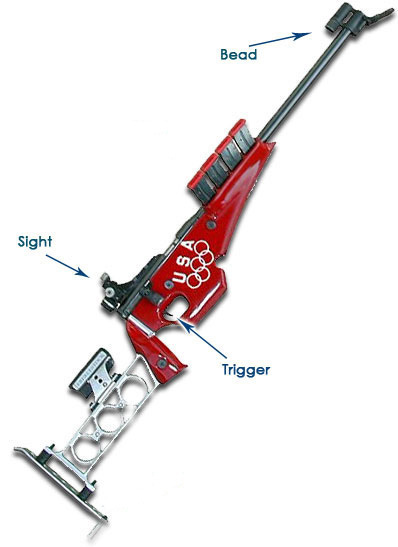 A rifle sold at auction -- five different times -- at a recent Wild Sheep Foundation convention netted $175,000 to help train American rifle, pistol and shotgun shooters for the 2012 Olympic Games. Auction proceeds go to USA Shooting, the official U.S. Olympic firearms training group. Shooting sports are the number two consumer sport in the nation -- behind exercise (health clubs, home equipment, etc.) and ahead of golf (you've heard of golf, right). The media's gross bias is plainly evident in the amount of "news" coverage the shooting sports get, namely virtually zero. Even in the Olympics it barely gets any mention. The media digs its own grave by omitting news half the country would devour. The Million Gun March on Washington -- now The Second Amendment March on Washington since guns are basically banned for citizens at the seat of our government -- is progressing with great vigor. The NRA is cooperating, posting frequent announcements to their massive lists. The event, more of a rally than a march due to logistics, will take place from 10AM to 4PM. Assemble at the NE cor. of the Washington Monument grounds. Nothing. Hey, you already know if it's good gun news, the "news" media are absent without a doctor's note. Federal bureaucrats conducted 1,119,229 NICS background checks on the retail sale of firearms in January, ranking the month as the second highest January for NICS checks. This figure, a 7.8 percent decrease from the January 2009 surge in firearms and ammunition sales -- is an increase of 18.7 percent over checks in January 2008. The NSSF used official NICS stats in releasing this story. Although the media and the public has continued for decades to suggest there are 250 million firearms in private hands, the NICS figures force an intelligent person to increase that number by about 10 million per year. The Uninvited Ombudsman invites someone else to go through the NICS numbers, publicly posted, review old news clippings, and do the math which, if well done, will be posted here with attribution. Nothing. Just because the media omits all this news doesn't mean I'm going to. State Rep. Warner McBride (D-Courtland) has introduced legislation in Mississippi (HB 1207) that would exempt firearms and ammunition sold over Labor Day weekend from sales tax. This program generated beau coup sales in Louisiana when a similar plan was run for the second time in 2009 ("The Louisiana Second Amendment Weekend Sales Tax Holiday). The firearms industry is working with an economist to develop data in support of such tax-free holidays. This data would be used to encourage the introduction and passage of similar legislation in other states. Currently, tax-holiday legislation is pending in Kentucky, Oklahoma and Missouri. Maybe we should move the New York City trials of Islamist jihadi mass murders elsewhere. It seems obvious to everyone but federal officials in power that "soldiers of allah" attacking us or attempting to attack us are enemy combatants -- not suspected criminals in need of Miranda rights. If we spend an astounding $216 million on security (in the first year alone!) for a trial of confessed atrocity murderers, even though that will "create jobs and help America's economy" (no officials have said that but you know they're thinking about it, and "officials" in one upstate New York city are actually lobbying for the gig), the muslim insurgents have won this round. They are laughing at us. Those of us with brains are laughing too, between the tears. Why isn't the media -- or anyone -- questioning how the executive branch is considering moving a trial, which is the clear responsibility of the judicial branch? Isn't there a separation of powers anymore that we used to cherish as a bedrock of our freedom? Can the executive branch do that to your trial? While the NFL is busy providing another phrase you can't say for my upcoming book (Bomb Jokes At Airports -- and 186 other things you'd better not say), the media has missed the central point in the entire story. "Who Dat" is a racial slur against people of color who can't speak proper English. It was popular in the now suppressed hysterical TV comedy series Amos and Andy, which was branded racist by racists and other people who couldn't appreciate the humor, and can no longer be broadcast despite First Amendment guarantees. Mr. Obama hisself was raked over the coals for being too "articulate," a code word, according to news sources, for a black person who isn't black enough. "Who dat" is an ebonics phrase, the dialect Mr. Obama is accused of not using by, among others, senate majority leader Harry Reid. It means, "Who is that?" Rahm Emanuel used a word, "retarded," that is now socially banned, and he has been asked to step down from power by Sarah Palin, a FOX News commentator. Both parties, all news commentators, Sarah Palin and the rest of the sadly brainwashed public should stop complaining about nouveau-naughty words and understand that words are just words and that's OK. Being offended by words is, well, retarded, but a personal choice people are free to make. The glorious American ideal of free speech flatly rejects the idea that some words are bad or unacceptable, and politically correct attempts to ban and manage language is an arch enemy of The American Way. According to leading experts who refused to be identified, anyone who complains about the word retarded is retarded. And we all know some people are indeed really really retarded, even if they're smart about it. Writing for the AP, Pauline Arrillaga says, "Forget 'can,' 'change' and, above all, 'hope.' The new word echoing in the blogosphere and beyond as Obama enters Year Two: disappointment." In a rare public appearance, four members of the Associated Press chatted with and took questions from the Arizona Book Publishing Association, during the group's first-of-the-year monthly meetings. Often reclusive, three editors and a national writer described the inner workings of the AP, their roles within it, and specifics of how they find and report stories. The AP writer told of an assignment she got from the New York office, formerly the core of AP, and now restructured as one of four regional hubs. It seems the nation was bursting with hope and optimism right after Mr. Obama's inauguration, and now, one year later, everyone was disappointed and dejected. "But wait," pointed out The Uninvited Ombudsman, the emcee for the evening event, "for half the nation's people, there was hopeless disappointment and dejection right after the election, and now, a year later, there is finally a ray of hope and light at the end of the tunnel. Doesn't your story neglect that half of the picture?" All four AP staffers, who had nodded approvingly during the anecdote, stared like deer caught in headlights. They emitted a nervous chuckle. Then half the audience at the packed event, realizing that insidious institutionalized bias had been self exposed, broke out into boisterous cheers and applause. The writer stammered a bit, mumbled about speaking to "those people" too (though even if true it didn't get into print) and the meeting moved on, the point having been made. Leftist bias is so deeply ingrained at this "news" organization that self-evident errors of omission are all but invisible to them, up and down the line. Toyota, normally known for reliable and safe cars, is having trouble with sticking gas pedals, and after enormous pressure from Congress -- which the carmaker fiercely resisted for years -- has instituted a massive vehicle recall. Now even its best-selling hybrid Prius is under scrutiny, and Congress is considering fining the Japanese automaker an amount thought to be in the hundreds of millions of dollars. In a novel extension of age-old extortion schemes, the U.S. Congress is considering demanding money from one of its car-making rivals for selling shoddy products to American customers. "It's incredibly clever," says one car expert. "A private foreign company sells bad products to private American people, harming them. The governing class uses the situation to step in and charge enormous fees to the seller -- and then keeps the money, calling it 'fines.' If government still represented the people, the money, if the takings can be justified at all, should go to the people harmed, not government bureaucrats and apparatchiks." Since commandeering ownership of General Motors and Chrysler and installing its own federal "czars" to run them, Toyota just happens to be the biggest competitor the U.S. government has. "The ability to hurt your competitor with so-called fines, after forcing massive recalls, is a competitive edge beyond description," says the expert. Governing elites have used similar schemes in the past. Page Nine recently reported on the practice of making rules for running airports that cause massive delays and trap passengers for endless hours in aircraft. The elites then step in, fine the airlines for the inconvenience endured by the paying customers, and keep the money. "As the government's fiscal crisis worsens, we can expect more pernicious extortions in the future." Baby Gabriel has dominated nightly news for weeks, the poor sweet innocent thing, this could happen to you if you're not careful. Be afraid. If the media was doing its job you'd know that more than 100,000 people are officially on the missing persons list. More than 800,000 are added every year, most of which are false and removed. By focusing on a single case the "news" does a disservice to the entire country, making an isolated incident seem meaningful, and hiding the true dangers of incessant kidnappings, abductions, runaways, rubouts and unexplained disappearances. Try to imagine thousands of parents, spouses, siblings and friends, desperate over the mysterious loss of their loved ones, while watching the media fawn and anguish and completely ignore any of their real ongoing concerns. Government records show: As of December 31, 2007, there were 105,229 active missing person records in NCIC database. Juveniles under the age of 18 accounted for 54,648 (51.93%) of the records, and 12,362 (11.75%) were for juveniles between the ages of 18 and 20. Reasons for removals include: the subject was located by a law-enforcement agency; the individual returned home; or the record had to be removed by the entering agency after determining it was invalid. In 2007, there were 518 records entered as Abducted by a Stranger; 2,919 entered as Abducted by Non-Custodial Parent; and 299,787 entered as Runaway. This only accounts for 303,224 entries of the 418,967 entered. If this was covered by the media, they'd have no space for anything else. One child incessantly on TV vs. hundreds of thousands reported missing, many of whom are never seen again. The media that considers its coverage of this subject ethical should turn up missing. "In Fireworks (copyright 1980), Chapter 3 is titled, 'Open Letter: To a Legislative Hoplophobe.' In it, Dad defines hoplophobia and puts a date to this definition of 1966. HOPLOPHOBIA. (1966) From the Greek __ (weapon) plus __ (terror). An unreasoning, obsessive neurotic fear of weapons as such, usually accompanied by an irrational feeling that weapons possess a will or consciousness for evil, apart from the will of their user. Not equivalent to normal apprehension in the presence of an armed enemy. Hoplon also means instrument, tool or tackle, but it is the root of hoplite (man-at-arms, gendarme) and thus principally signifies "weapon" in English derivations." The McCain-led attempt to pass amnesty for 20 million illegal aliens under president Bush died an excruciating death and has remained dead, due to public outrage. Hillary Care, with all its hoopla and new-president infatuation, died a horrible death in 1992 and stayed dead until recently. True, they've enacted bits and pieces, proving we must remain eternally vigilant. Real ID was a done deal, until the public rose up, state-by-state with an outcry so loud the states themselves revolted, and Real ID died. Oh, it's not dead dead, and federal bureaucrat tyrants have every intention of renewing it, but the will of the people forced the death of that bad plan. The Health Care takeover, intended to be passed quickly in February of last year (2009) -- remember when Obama wanted it done in weeks? -- it has languished and now lies, broken and morally bankrupt on its death bed. Yes, they're still trying, but we the people have the power to halt bad laws even if we can't seem to wedge the perennial Congresscritters out of their seats. Even gun rights, which Obama and his minions were determined to violate and extinguish, remain untouched due to the tangible pressure they feel in the wings from we ammo hoarders and massive gun buyers and new gun buyers. He's not done, and he's working international treaty schemes to avoid Congress and representative government, but the will of the people still carries weight. Keep the faith baby. If we set our minds to it we can crush the bad feds in their tracks. Aren't Hillary and Bill still married? Why don't we see them together anymore? Where are the exposes on their exploits as they globe trot the world? Is there some difference between their vacuous marriage and that of Angelina and Brad? Doesn't the lack of morality and marital vows merit coverage like Tiger gets? Or even more, since Bill and Hill are slightly higher on the food chain? Curious minds want to know. Is ACORN still funded? Both houses of Congress passed a defunding bill, to enormous fanfare and hand-wringing recriminations. But both houses still need the president's signature, right? And bills can have sections amended out later, right? And an announcement of closure hasn't been made, has it? Actually it was, but then a NY State federal district judge ordered Housing and Urban Development, the Office of Management and Budget and the Treasury to "disregard" the bill and reinstate funding. Now that's power. She wondered, "whether the Constitution allows Congress to declare that a single, named organization is barred from all federal funding in the absence of a trial." ACORN argues the measure is a bill of attainder, banned by the Constitution. So for now, ACORN still gets taxpayer money by the boatload. Does the president want to keep ACORN funded, since they're his loyalists? Ask your local "news" outlets what happened. If YOU don't personally keep your local media's email addresses handy -- you should. And send copies to me, I'll put them to good use. What are the U.S. czars up to? Mr. Obama put dozens of them in place, outraging Americans everywhere, and now they're just there, doing whatever it is they do. FOX, the only "news" outlet to cover the situation with any zeal, hasn't used the word czar in recent memory. What do the czars do now that they're in place? How much money are they controlling? How much harm are they doing to The American Way? How many of their leftist lackies have they put in positions of power? Curious minds want to know. Thank you for another highly informative and thought provoking newsletter. --Bob H.
Another fantastic issue. Congratulations Alan, and keep up the brilliant work. --Andrew P.
Alan, You do know that spade is a derogatory term for a black person, don't you? --Alan S.
Alan, you wrote: "Swiss voters overwhelmingly approved a constitutional ban on minarets..." and then "...It is unknown if Americans will show the testicular fortitude of the Swiss, but one can hope." Careful, Alan, that sounds an awful lot like "... or prohibiting the free exercise thereof..." --Mike G.
No. 77 was wonderful. Right on, on all counts. The further down I read the more I was inspired. Thanks. The Uninvited Ombudsman is one of my favorite reads. --Paul L.
Hoo-boy. So much two-thumbs-up-material that both thumbs are tired and my neck has a crick in it from nodding so dang much. -- Barrett T.